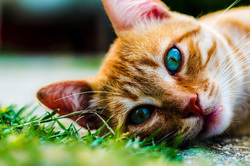 Cats and dogs are susceptible to a number of parasitic infections, several of which are zoonotic (possess the ability to infect people as well as animals). Parasite prevention is not only important for the health of your pet but also for the health of your family. It is for these reasons that you should contact us today to check on setting up a routine testing schedule and monthly preventatives. The first step in intestinal parasite prevention is appropriate deworming of puppies and kittens early in life. Young animals acquire intestinal parasites from their mother while in her uterus or through her milk. Therefore, a large percentage of puppies and kittens are infected with intestinal parasites at the time they are adopted. 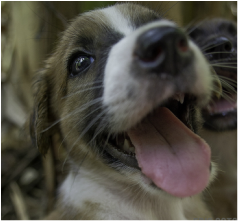 Puppies and kittens should be dewormed every 2-3 weeks until they are 12 weeks old. Animals that are older should be dewormed at least twice when they are first adopted. Once initial deworming is completed, dogs and cats should be put on a monthly, year-round product that prevents intestinal parasites as well as heartworm infection. The most common intestinal parasites in dogs and cats include hookworms, roundworms, whipworms, tapeworms and coccidia. Most intestinal parasites are not overtly visible in feces, a small sample of your pet’s feces is used to performing a microscopic analysis. Parasites can affect your animal’s health long before you notice any symptoms, call today to schedule an appointment! Fleas and ticks are troublesome parasites of the skin. Flea and tick prevention is important because not only can they cause problems with the skin, but they possess the ability to transmit a number of diseases to the pet. Fortunately, there are many safe and highly effective products available. Regular use of one of these products can effectively prevent fleas and ticks from becoming a problem for your pet. Attempting to control fleas on our pets is a multi-step process. Adult fleas spend most of their time on an animal, but the flea eggs, larvae, and pupae are found in abundance in the environment such as in carpeting, rugs, bedding, and grass. For every flea that you see on your pet, there are likely to be hundreds of eggs and larvae in your home and yard. Therefore, a truly effective flea control program always includes treating the environment as well as treating your pet. Heartworm is a worm that resides in the heart and lungs of infected dogs and cats. It is carried by mosquitos who transmit heartworm larva into the bloodstream of the pet when they bite them. These larva then develop into adult worms that over time cause heart disease and respiratory problems in dogs. In cats, the signs can be more vague including vomiting, coughing, weight loss and sudden death. Heartworm has been diagnosed in all 50 states, so regardless of where you live, heartworm disease poses a threat to your pets. Fortunately this is a preventable disease and there are a number of excellent monthly heartworm preventatives available. These products when given year-round provide outstanding protection against heartworm disease, and many also protect against several important intestinal parasites that can infect dogs, cats and people. Preventing heartworms is a lot cheaper than treating them, because heartworm treatment can cost up to $1000 in medication and veterinary bills. Annual testing will either verify that the heartworm prevention is working properly or diagnose an infection in the early stages so that treatment can begin promptly. Testing is really an inexpensive insurance policy for you pet. ​While heartworm disease in dog can be treated, and the worms eliminated, there is no treatment for cats. Even with treatment, however, the damage left by heartworms is forever in both cats and dogs. For more information about Heartworms, intestinal parasites and Flea and Ticks, visit our Educational Information page or call us with questions! To order your Parasite prevention, visit our on-line store.